Back for a few decades on either side of the turn of the last century, a flotilla of little ships used to travel Puget Sound, carrying passengers and freight, stopping at every settlement along the hundreds of miles of waterfront along Puget Sound. This was, of course, back when water was the easiest and fastest mode of transport in the region, before roads were built and the cars to run on them became ubiquitous. These little ships were so ubiquitous themselves that some wag dubbed them the Mosquito Fleet. And the name stuck. Almost all of them are gone now, but Kitsap County Transit still operates one of the little ships as part of the foot ferry service between Port Orchard and Bremerton, Washington, along with two larger and slightly newer foot (as opposed to automobile) ferries. Unfortunately, the Mosquito Fleet boat, which purportedly has an onboard exhibit about the fleet, was down for service the day I took my trip, but I did get to ride one of the other boats, which mostly carries people who live in Port Orchard, but work in the Puget Sound Navy Shipyard, among other places, in Bremerton, back and forth on what has to be one of the more unusual commutes around. One of the two Port Orchard – Bremerton foot ferry boats operating the day of my trip. The foot ferry boat I rode on, the Admiral Pete. The inside of the Admiral Pete. Looking towards the pilothouse of the Admiral Pete. Looking towards Bremerton from the Port Orchard dock. Looking back towards Port Orchard. The Admiral Pete’s wake. It’s a catamaran. The Puget Sound Naval Shipyard from the ferry. Once I arrived in Bremerton, I headed for the Kitsap County Historical Museum, which I’d heard had an exhibit on the Mosquito Fleet. Which it did, including an interesting historical map, and profiles of some of the boats. Part of the Mosquito Fleet exhibit at the Kitsap County Historical Museum. A map of Mosquito Fleet routes at the Kitsap County Historical Museum. That big gray thing on the right that looks sort of like Pac-Man is Seattle, and the smaller square below it is Tacoma. The museum also had very good exhibits on the history of the Kitsap Peninsula (the west side of the Sound), and some fun stuff about life in the early days on “stump farms” (the kind of farm you have when you try to grow crops on logged-over land). The Bremerton pier attracted my interest next. It’s designed for strolling, and the views were lovely. This statue was nifty, too. A sculpture on the Bremerton pier. Once I was back on the other side of the ferry terminal, I took a gander at the Puget Sound Navy Museum, full of the history of the Puget Sound Navy Shipyard next door. It also housed several mockups of various parts of the USS John C. Stennis, an aircraft carrier. I think the part that impressed me the most was how cramped the bunks were, barely 18 inches vertically between mattress top and the bottom of the bunk above. If I didn’t already have claustrophobia, I’m afraid trying to sleep in a bunk on the Stennis would have given it to me. My last stop of the day was at Fountain Park, located between the shipyard and the ferry terminal, which doesn’t sound like much of a location until you realize just how far out over the water you can see. All the way to the southern end of the Olympics. And the fountain? Is just the coolest thing I’ve seen in a very long time. It’s actually half a dozen fountains, each designed to look like a submarine coming up out of the water. The fountains shoot water out of the tops randomly. The only warning you get is water starting to pour down the sides, more and more, and then all of a sudden water just shoots out of the top, about, oh, I don’t know, twenty feet high or more. And they go off one after another after another, in a completely random order. It was all I could do to drag myself back to the ferry terminal, even though I was looking forward to the ride back. The fountains at Fountain Park. One of the fountains erupts (like a geyser!). The large boat to the left in the back is the ferry that goes from Bremerton to Seattle. Anyway, if you ever get to go to the Kitsap Peninsula on Puget Sound, I highly recommend the foot ferry from Port Orchard to Bremerton. And go watch the fountains for me! Point Defiance Park is one of the most beautiful places in Tacoma, Washington, and that’s saying a lot. It’s a huge city park (708 acres) on a point sticking out into Puget Sound, with a zoo, a waterfront promenade and beach, a replica of a historic fort, extensive gardens, and expanses of old-growth forest laced with hiking trails. An iconic western Washington view — the Pt. Defiance-Vashon Island ferry making its run across Puget Sound. Shaded in the foreground to the right is the waterfront promenade walk at Pt. Defiance. In the background is Mt. Rainier. It’s the time of year for dahlias, and the dahlia test garden at Pt. Defiance is in full bloom. This is my favorite kind of dahlia, known as a ball dahlia. This dahlia looks like a peppermint stick. These white dahlias were bigger than my outspread hand. Some of the dahlias on display were bigger than my head. One of a dozen rows of dahlias in the test garden. This pretty walkway lined with yellow rudbeckias, white Japanese anemones and hostas in lots of shades of green, is near the dahlia garden. Pt. Defiance also has a huge rose garden, which is still going strong now in late August. I don’t know what kind these are, but they’re profuse. This is my favorite color of rose, kind of an orangey salmon. And here’s a view of part of the rose garden with its gazebo, which is popular for summer weddings, and for good reason. We left Alaska for the last time sometime in the wee hours, and drove off the ferry in Prince Rupert, British Columbia, at seven in the morning. Except for a stop along the way to buy groceries at a supermarket which was having a sale on fresh fruit, my father drove all day long, almost 500 miles. I slept all morning in the back seat of the car, and my mother slept there all afternoon. I’m not quite sure how my father stayed awake to drive that far on so little sleep, but he did. It wouldn’t have been the first time he’d done something like that. When we went to Louisiana a few years before, my three older sisters were still living at home, and it was the first time my parents had left them home alone for any length of time. My oldest sister was in college at the time, and my other two sisters were almost out of high school. Anyway, while we were in Louisiana, my sisters called my grandmother’s house to report a peeping tom. We promptly climbed in the car and headed for home. The first day we drove from northern Louisiana to El Paso, Texas (about 950 miles). The second day we were going to spend the night just outside of Phoenix (~500 miles from El Paso) , but my father decided to keep going. We finally arrived home in suburban Los Angeles in the wee hours of the morning, after over 800 miles and what my mother refers to as “our midnight ride through Palm Springs,” due to a closure of the Interstate because of a sandstorm and a rather out-of-the-way detour. I don’t remember it because I was asleep in the back seat at the time. The peeping tom turned out to be our next-door neighbor’s mentally disabled son, but nothing worse. At any rate, my father managed this day’s drive to a campground forty miles east of Prince George, and, as my diary says, “we are sleepy.” I do remember it, it was quiet and wooded and we were just about the only people camped there. A perfect place to catch up on one’s rest. We arrived in Petersburg about 1 pm, and Wrangell late in the afternoon. I’ve not been back to them. We didn’t go to Sitka. Not all of the ferries do. When I went to Sitka as part of my 1995 trip, I took what I thought of as the “milk run” ferry, a smaller vessel from Juneau, which sailed in the morning and stopped at several small settlements along the way — Hoonah, which was a Native village, Tenakee Springs, which was sort of counter-cultural and didn’t allow cars, and Angoon, another Native village — before arriving at Sitka at about four in the morning the next day. The settlement of Tenakee Springs — classic SE Alaska. And that was our whole day on the ferry. “On the ferry, headed for home.” Which sounds rather like we were all glad to be on our way. As my diary says, “we didn’t do a thing all day except wait for the ferry,” which didn’t leave until 10 pm. I don’t think I was terribly impressed with the ferry, even though the ships of the Alaska Marine Highway are large, almost cruise-ship-sized vessels, and on my 1995 trip, I rather enjoyed riding on them. On that trip, however, it was just me, I was prepared to camp on board (which we decidedly were not in 1973), and I got off the ferry and spent several days in three different places along the way instead of staying on for a straight shot through. The MV Taku, the ship we rode on from Haines to Prince Rupert. The real problem is that there are far fewer staterooms than there is room for passengers, and if you think getting reservations for our car and trailer was hard, getting a room was impossible. You’re not allowed on the car deck while the ship is underway, so sleeping in the trailer, which otherwise would have solved the problem easily, was right out. It only takes a bit less than 30 hours to sail from Haines to Prince Rupert, but because of the schedule, we had to spend two nights on board. We moved from the observation lounge to the outdoor deck in back, and back. As I recall, I got the most sleep of the three of us, and I remember getting about five hours total for both nights. A story my mother still tells about being awake all night on the ferry was how foggy it was in the wee hours, and how she heard someone on the loudspeaker ask in a whisper that carried all over the ship (obviously whoever it was hadn’t realized the speaker was on), “Where are we?” Not terribly reassuring [g]. Still, the ferry was an adventure — the only other time I can remember riding one before this was going from the town of Tsawassen, near Vancouver, BC, to Vancouver Island, then from Victoria, BC, to Port Angeles, Washington, on a trip we’d taken several years before. When I made my Alaska ferry trip in 1995, one of the best parts of the trip was seeing what we’d missed on this trip in 1973. It was something I’d always wanted to do, get off and explore those little towns we’d stopped in just long enough to whet my curiosity because we couldn’t get off and see what was really there. On our last full day in Haines, we went shopping in the morning. My father bought a foot-tall sticker of a totem pole to put on the trailer, to add to one of a Dall sheep that he’d apparently bought earlier in the trip. In the afternoon, we took the ferry to Skagway. The trip takes an hour, according to the Alaska Marine Highway website, and at the time, the ferry and the railroad were the only way you could get to Skagway, back in the days before the highway to Whitehorse was built and there were so many, many cruise ships the way there is now. But it was still two more ways than you could get to Skagway back in True Gold‘s heroine Karin’s day. 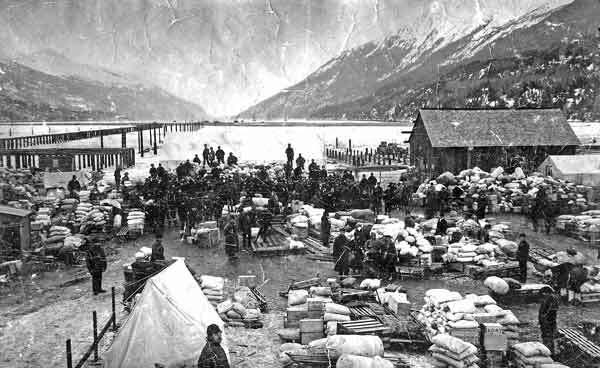 During the Klondike gold rush, the only way you could get to either Skagway or Dyea was by boat, and not the clean modern ferries that make the run today, either. Skagway, Alaska, as Karin would have seen it in 1897. Karin arrived in Dyea, which is just across the head of Lynn Canal from Skaguay, as it was spelled back then for a Tlingit word meaning home of the north wind, in August of 1897. She spent over two months there before heading north over the famed and snowcovered Chilkoot Pass, where she spent a long cold winter on Lake Bennett with several thousand other people, building boats and waiting for the ice to break up on the long chain of lakes and rivers feeding into the great Yukon River leading to Dawson City and the Klondike. Which I promptly dropped on the seat belt buckle in the Chrysler’s back seat when we got back to Haines. Which broke the hind leg off of the papa sheep. Bone china Dall sheep from Skagway. We stayed put on this day. I didn’t realize it back then, but basically what we were doing at this stage was waiting for it to be our turn to take the ferry from Haines down through the Alaska panhandle to Prince Rupert, British Columbia, from which point we would drive home. The Alaska Marine Highway (as it is called) is very popular, and was even back then, and you couldn’t just get there, wait your turn and drive on. In 1995, when I took the Alaska ferry north from Bellingham, Washington, to Ketchikan, Juneau, and Sitka, then back to Bellingham, I had to make my reservations months in advance, and I simply walked on, with no vehicle, on that trip. With a car and twenty-foot travel trailer, and no reservations when we left home, I suspect we were really lucky, even back in 1973, to be able to get on at all. I do remember my father making calls to the ferry offices several times during our trip, but it didn’t seem that big a deal to me at the time. I don’t know if the reason we didn’t make reservations before we left home was because my parents had planned to drive the Alaska Highway both ways, or if they just hadn’t realized that you had to make reservations in advance. One doesn’t normally think of doing so to ride a ferry, normally. But then ferry routes don’t normally take several days to traverse and cover hundreds of miles per trip, either. I do know we were twelve days out from the date my father had to be back to work, and still a very long way from home. I suspect my father might have underestimated the sheer amount of travel time it took us to get to Alaska in the first place. It would have been a very Daddy thing to do (see my mother’s claim that my father’s idea of the perfect vacation was driving as far as he possibly could before he had to turn around and come back in order to get back to work on schedule). Anyway, it was a pretty day, and we walked the beach and collected more driftwood and fed bread to the sea gulls on the lake, and met up with a very large family (eight kids? ten?) from eastern Canada who were traveling in a converted school bus with a canoe on the roof. One of the girls was my age, and we hung around together a bit. I remember she told me they were having sausages for dinner, which I now suspect were brats or something like that, but which I thought was odd at the time, since to me sausage meant breakfast patties. And that was our second day at Kluane Lake.